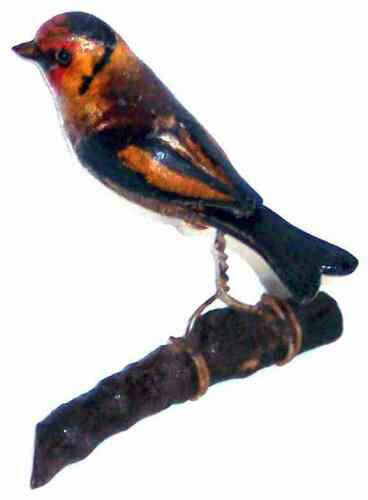 Presented here, a delightful little Red Crested Finch on a Branch. 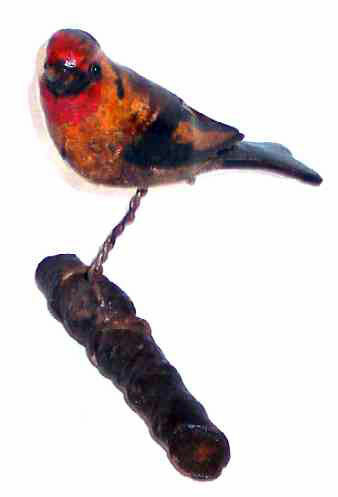 This carved and painted bird dates from the 19th century and is most likely from Pennsylvania. Made by a gifted carver who understood the "essence" of the bird, the paint pattern is very realistic and the colors are bright and vibrant and there is nice detail in the raised wing carving. There are no chips, cracks or breaks and the paint remains in fine original condition with only minor loss from handling. Most of this is on the underside of the breast where it does not show. Overall length is 4-1/2 inches.